Twendz is a Twitter application which gives users the chance to look into the trends of the day. This innovative Twitter widget examines the emotion behind each popular subject, cleverly monitoring the proportion of positive, neutral and negative tweets for each topic. As a result, users can see the level of emotional response to the keyword of their choice. Sadly, it’s not statistical in the slightest and any data is subjective to real-time tweets (data is pulled from tweets occurring after users begin monitoring the trend). Twendz is a useful slice of customer sentiment but don’t expect to harness any statistical data. Twitalyzer is a great Twitter application if you want to measure the reputation of an member on the site. The website analyses a Twitter account in four different ways, creating a unique metric system on which to judge its success (or failings). This Twitter widget rates an account on its influence; the number and quality of its followers, the amount of retweets, and number of '@' mentions. Twitalyzer then produces a score based on these factors. This analytical process can be used to highlight areas of a social media strategy that need improving as well as allowing users to compare their campaign to rivals in the same industry. Twist offers an 'insights-esque' service for statistic hounds. This Twitter application allows visitors to discover the percentage of members discussing a specific topic; those of an analytical nature can enjoy detailed graphs following the rise and fall of a particular trend over 24 hours, 7 days or one month. It’s a great Twitter application if you’re seeking statistical data on the success of a product or marketing campaign. 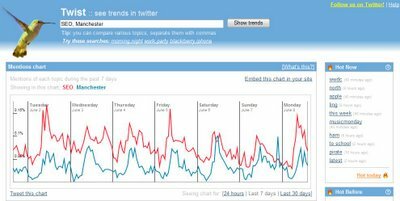 As this Twitter widget also allows users to compare tweets over a specific timeframe, it’s useful for those wanting to analyse the success of different trends over a relatively short time period. Sadly, the Twist Twitter application does not contain statistics over a longer period (presumably because of the sheer scale of data available), so it’s not yet suitable for monitoring long-term campaigns. Monitter is a Twitter app ideal for monitoring tweets from a specific geographical area. This site allows users to compare three search terms over a specific distance - up to 100 miles or kilometres. The Monitter Twitter application draws up search results in real time, which allows users to gain an appreciation of the number of users discussing a topic. The geographical element comes into play if your marketing campaign is location-specific and as far as we’re aware, it is the only Twitter application with this particular tool at its disposal. There are not really any statistics to speak of; tweets flow through when and if they happen. Tweetscan is a great Twitter application if you’d prefer a hands-off approach to social marketing. This Twitter app sends users an email update notifying them of any tweet containing a specific search term. Updates can be received on a daily or weekly basis depending on interest or need. This Twitter application is a low-maintenance service which is perfect for users dealing with a low-frequency search term.